That's how I feel as I type tonight. Many of you might have expected news on Rachel with such a title. And though I could fill this post with the heartbreak that fills Rachel's story, the feelings exploding onto this page are so much bigger than she is. Mothering a critically ill child changes... well... EVERYTHING! And through the process, I have been introduced to more heartache than I've ever known before. Sadly I am not even talking about my own... Adopting Rachel ushered me into a world I had been successfully trying to avoid my entire life. Maybe I would have discovered it with age anyway. But it feels that in the past year I have taken the "fast track" to more heartbreak than my human heart feels it can bear. I'm embarrassed to admit that I've been shielding myself from it for so long. I enjoy comfort. I like "ease". Vacations are awesome... the only negative part? The work involved! I love to sleep in and I love to be served. A day at the spa sounds just perfect! Three kids, a nice home with a white picket fence, and a minivan with a DVD player... picture perfect, of course. I like it when my husband adores me and treats me like the most important human on the planet. I like report cards of all As, followed by comments from teachers filled with wonderful adjectives describing my children! I like it when people think of me as a really great mom, and if it's one of my kids thinking it... well, it doesn't get better than that! I like letters addressed to me that tell of undying love and devotion. And when any of the above is true... you can bet I'll post it on Facebook and on Instagram so that the whole world knows about the wonderful ways God has blessed MY life! Now that I have a child that visibly totters on the edge of life and death... I like stories of healing best; of miracles and children discharged from hospitals for a long awaited homecoming. I especially love the news that brings with it a brand new heart just in time, or a miracle cure that means they won't need it after all. I'm addicted to websites and blogs that share the beautiful story of redemption through adoption... the instant connection, and overwhelming bond from Day 1. A child once considered "terminal", now home and thriving! But somewhere along the way I forgot that the planet I call home and the people that inhabit it with me, are terribly broken. And since the beginning of time, when death entered in through sin, the nightly news across the globe has been filled with heartbreak. BUT GOD (the most beautiful words I know) has been behind the scenes all along, quietly weaving a miracle story of redemption for us! Those of us that know Him as Lord, have the unique privilege of being a part of that story. And yet most of us are so wrapped up in the story of ourselves, we miss it all together! Somehow we bought into the lie that the world is all about ME!... my comfort, my ease, my picket fence, my perfect kids, my perfect marriage... need I go on? Lately I have discovered heartache in the most unexpected of places... I found it smack dab, in the middle of my prayer closet! God invites me to draw close to Him and feel each heartache with Him. Sometimes there is sweet relief in an unexpected miracle, but a lot of times there is no instant relief and I am invited to sit quietly with Him instead, and wait for the sweet redemption that is to come. Sometimes God calls my name and asks me to be a part of one of those sweet miracles, like leading my three kids to Jesus, or crossing the oceans to redeem three more through adoption. Each and every time, though, I can only participate when I am willing to die to myself... my comfort... my ease... my fame. Even bringing my prayers to the throne of God requires a kind of death to self that makes me uncomfortable, because my needs and the needs of the people I care about are burdensome. They are heavy! They make me enter a world full of pain and brokenness and force me to cry out to God in utter dependance. Often I'd rather try to solve the problems of the world in my own strength, and only humble myself in prayer as a last resort. Because if we are really honest... prayer IS the real work and we, humans, tend to choose easy instead! Many times I'm afraid God's answers might not be the ones I want, so I don't ask or I resort to begging for MY will to be done.... But since life and death hang in the balance for my child and so many others I care about, I've found my way to that quiet place more than ever before. I've discovered a Father who's heart is broken for His children and the more time I spend with Him, I find that I am heartbroken too! This is my family (most of it anyway)... If I were honest, I'd admit that much of my prayer life is spent with their names on my lips. The answers to the prayers spoken for the ones I love so much are not only my greatest delights, but some have been my greatest heartaches too! Often I must lay my prayers before the Lord and wait for days, months, and even years before realizing His answers. Will I continue to trust Him while I wait? This photo shows the happiness we share... what you can't see is the heartache beneath and the hardships that were the glue that brought us so close. God's blessings often disguised in pain. This, of course, is my Rachel. Is she precious, or what? She brings such a joy to our home... I can't even describe it. But behind her smile is one of the most heartbreaking stories you will ever hear. She's taught me that JOY and heartache can coexist. I might need to remind myself of this in the days ahead... Tonight I looked into those eyes- glistening with life and wondered what might lie ahead. "I trust You, Lord... knowing that joy and heartache can, indeed, coexist!" In my mind's eye I could see two mothers before the throne of God... each crying out for the life of her child. (One of those moms was, of course, me!) A decision would be made in that moment that only God can make. The answer would bring terrible heartache to one mother, while the other would celebrate with exceeding joy! It is easy to ignore the "cost" of such an "answered" prayer... until that "un-answered" prayer is for the life of a precious little one like Samantha, who you are personally pleading for. 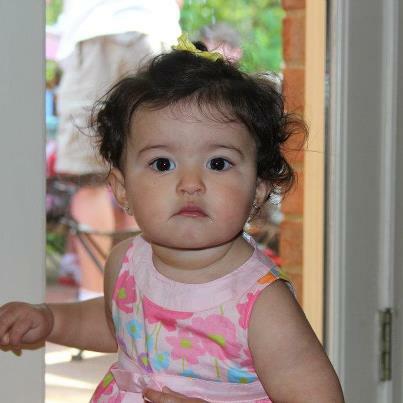 How I begged God on behalf of this precious child while she clung to life. "Have mercy on her mother, Lord... Please hear our prayers!!!" My heart broke as if she were my own when word came that she had passed away. 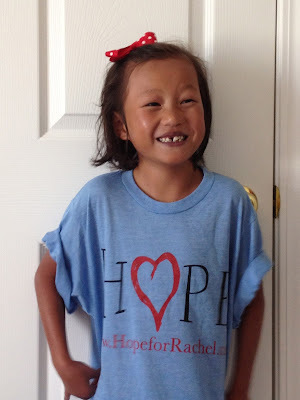 Just a few short weeks after Rachel was listed for a heart transplant, my cell phone rang. On the other end was the voice of a heartbroken father. His only daughter- precious and loved - laid in a hospital bed, losing her life to a terrible accident. "My wife and I would like to donate our daughter's heart to Rachel..." A stranger ~ delivering news that would bring great joy from the midst of absolute heartache. It was not to be. We would have to continue to wait for a perfect match for Rachel. God's will for this precious child and for the family that loved her so... brought with it, great pain. These next two angel's names have been spoken in my prayer closet more times than I can count lately. I have wept many tears for both of them and cried out for the hearts of their mothers... 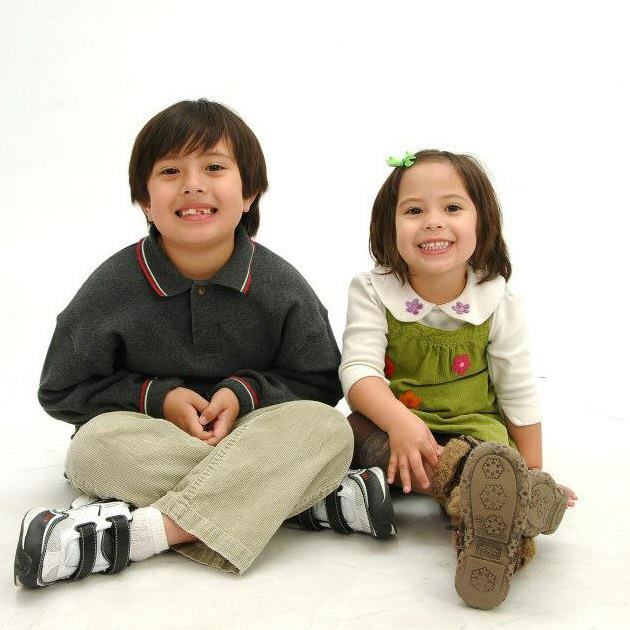 They are only two of the many, many "heart" children brought home from China recently. I have spoken to parents who have great hope for healing and others that have been told that nothing could be done for their child. How many prayers have been spoken for every single one of them? How many tears shed for their healing? How many petitions for a miracle? Some will know great heartache... Others, pure joy! 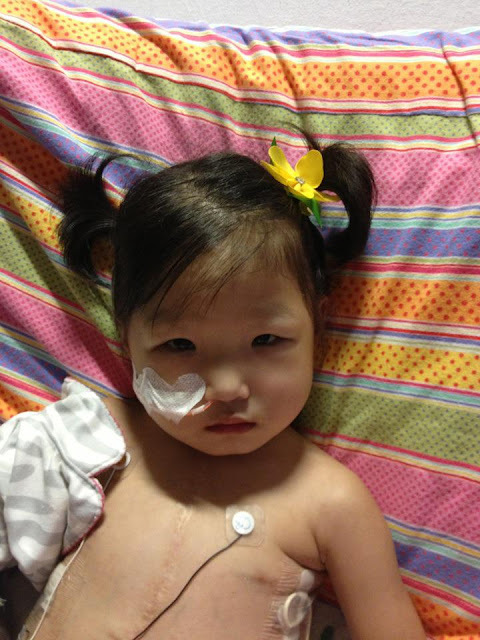 This special little girl has endured 5 open-heart surgeries since she arrived home less than a year ago! FIVE! 4 of them in a hospital a few thousand miles from family and home! Today she is still sedated and not breathing on her own... but it looks like her miracle has finally arrived! I can't even imagine the celebrations that will be going on when she finally goes home to her new family and really starts to LIVE!!! What a precious answer to prayer Ivy Joy's new life will be! 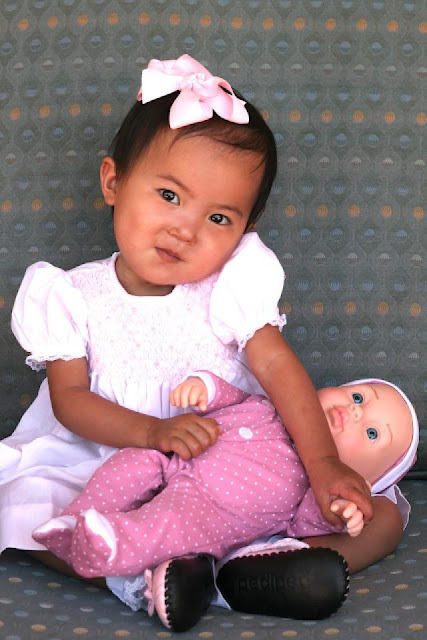 This precious little one has endured so much suffering in the past few months since coming home from China, that I can hardly utter her name in prayer without tears... And while hundreds and thousands gather around the Throne and cry out to God for a miraculous healing of her broken heart, that miracle has not yet arrived. At least not the one we've all been hoping for. A sister was adopted from China along with her, and she too is suffering and needs a special touch from God. On top of all that, their mommy, now a special friend, discovered that she was unexpectantly expectant a few months ago! How can my prayers even begin to express this family's great need for the Lord right now? In times like this... I simply don't even know how to pray. I rejoice in Ivy's miracle, but I agonize as Lily continues to suffer... If I told you I understood God's ways, I would be lying. I must lay it at His feet. He is a trustworthy God! I encourage her mommy with what I DO know... Heartache and JOY can coexist! I heard the sad news last week that a long-time friend of mine through the MOPS ministry was just diagnosed with a malignant brain tumor and given 18 months to finish her life here on earth. Her 4 children are stunned and trying to figure out how they will do life without Mom. Will God hear their prayers? Will He heal their Mom? Or will He choose a different way to glorify Himself through Stacie? Letters of encouragement are crowding her Facebook wall... One from another special MOPS friend who had a similar diagnosis over 5 years ago... God has done a miracle for Carol! Will He do one for Stacie too? God's answers are so often not the ones we would have chosen! Earthly healing never comes. Reconciliation is never complete. We grieve over the death of our dreams or of the people we love, while others are celebrating beautiful miracles and shouting about them from the rooftops. God's answers... so very different and yet all from a trustworthy Father who loves us and gives us His best, even when it is disguised in deep pain and heartbreak. Somehow, though, the more crowded my prayer closet becomes with needs, the quieter it gets... I simply don't have the words. And when I find something to say... my words are completely different than any I've whispered in God's ears before... "Be glorified, Lord Jesus" ..."Make us more like you!" ..."Overwhelm our hearts with JOY in spite of your answers!" ..."Let us know Your immeasurable grace!" ..."I trust you, Lord. Help me to trust you more!" When I lay my heavy burdens at His feet and leave them in His trustworthy hands, instead of demanding answers my way, I am at peace! Peace like I've never known before. And as I sit with Him quietly, I can hear His gentle whispering. "Bring this to me too, Lori... and this... and this" My heart is awakened to His! Awakened and broken at the same time... Heartbroken and yet filled with inexpressible JOY! Before we leave my prayer closet, can I ask you to take someone special with you and join me in praying for her? She's simply precious and has captured my heart! I see photos of orphans on a daily basis. Orphans who desperately need hope! And with a world filled with so many (way too many!) orphans, sometimes I feel helpless to do anything. Doug has begged me to stop looking at them on such a regular basis, because he knows my heart can not bear too much without wanting to bring home another. And, honestly... I've tried! But I can't stop looking. I can not turn away and pretend that they don't exist so that my heart won't ache. If I don't cry out on their behalf,... who will? Just the other day, this particular little girl captured my attention. Her story is so sad, I was tempted to look away. Her files are buried among 1500 others on what is called a "Shared List". This 11 year old girl has never had genetic testing, but her file says that she has Down's Syndrome. Many that have seen her photo say that it appears she may instead have Williams Syndrome. These children are known best for being the kindest, most tender-hearted human beings you will ever meet! But, sadly, her special need is not one readily embraced by the culture she was born into or by the limited number of families considering special needs adoption. 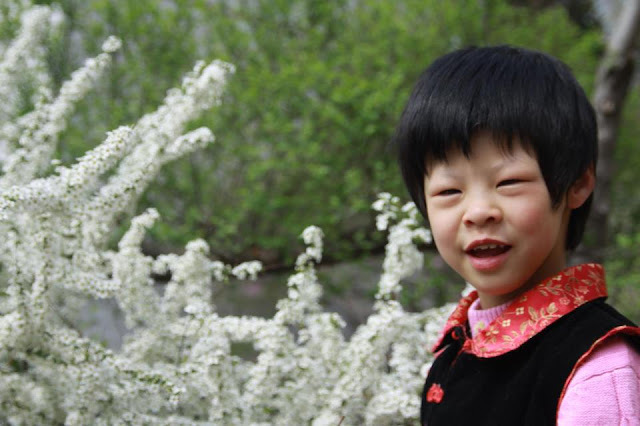 She was abandoned at 18 months old and brought to the orphanage. Her future in a country where many consider her disability a "curse" is bleak. When I think of what might be ahead for this precious child, I am simply heartbroken! I think this little girl has immeasurable value and I'm committed to praying for her, until God finally brings her home to a loving family of her own... Could that family be YOURS? I know full well that the costs are high. Not only to complete the adoption, but to raise her and love her in spite of her truly "special" needs. But this is the heart of Jesus! His heart breaks for her! He longs to love her through you! Oh, to "lose our lives" for His sake, and in so doing~ find them!!! To be HEARTBROKEN... and yet filled with JOY! I'm so happy you friended me. What a beautiful post and exactly how I've been feeling this past year. My heart breaks for these orphans and sometimes I feel overwhelmed and unable to do a thing, but I know God can do all things. Thanks for sharing. Thank you. I needed these words today. So many I love walking through such heart wrenching situations. He is near. Praying for sweet Emily. Thank you for sharing .. this is absolutely beautiful and so true. There is so much heart ache and brokenness and once you eyes and heart has been opened to it your heart is forever changed. It is amazing how joy can exist in the brokenness ... only because of the One who knows what it means to be broken hearted and to be full of joy. So thankful that in our weakness we can rely on Him and so thankful we can experience true Joy because of Him! Thank you for sharing so eloquently what I often think and feel. Our family was brought by God into this "medical family" world. For so many reason, I am thankful that He chose this path for us. It has opened my eyes to new joys, new grieves, and deeper trust in Him. May we all continue to seek to be deeply impacted by those who are in need... that we may love well for His name sake. Thank you Lori. An amazing post my sweet friend. Your post humbles me and while I am anxious for your phone call, I can't help but think "how am I so fortunate to have you reach out to me for information when words are so much greater than anything I could write." I may think them often, but never could I put it so beautifully!